There are few portable water filters that come close to the quality of the Katadyn Pocket Water Filter. They are made in Switzerland and live up to the reputation the Swiss have for making quality goods. This is a rugged, compact water filter that will "NOT" let you down in the field and is effective in removing bacteria, protozoa, chemicals and toxins, and particulates. It does not remove viruses, but if used in conjunction with the SteriPEN Defender you will have the safest drinking water possible - I own this one and I love it, it is a great water filter! There are few portable water filters that come close to the quality of the Katadyn Pocket Water Micro Filter. They are made in Switzerland and live up to the reputation the Swiss have for making quality goods. This is a rugged, compact water filter that will “NOT” let you down in the field and is effective in removing bacteria, protozoa, chemicals and toxins, and particulates. It does not remove all viruses, but if used in conjunction with the SteriPEN Defender you will have the safest drinking water possible – I own this one and I love it, it is a great water filter! The Katadyn Pocket Water Filter is made to last and there are enough testimonials online to back this up – in fact, have a look at the video below, this guy has had his for 11 years and it is still going strong! The video is a bit long and not really all that professional, but, it is a very good overview of the Katadyn Water Filter including instructions on how to clean it and store it – just remember, this one is 11 years old, the newer ones are better and easier to use. 11 Year Old Katadyn Pocket Water Filter Still Going Strong! Overall, the Katadyn Pocket filter is extremely durable. 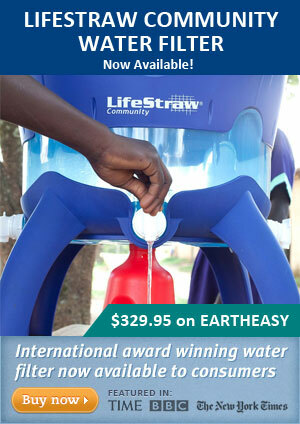 This is one of the few portable water filters that can take some serious abuse. It is not indestructible, but it can take a beating and still work 100%. I put mine through some serious punishment including driving over it with my car – NO DAMAGE! I also dropped it from 10′ (3 meters roughly) and no damage except a ding in the base. I’m not sure if the pump head could handle it, but that was as far as I wanted to go with my testing – I don’t want buy another one just yet. It will filter down to 0.20 microns which means it will remove all bacteria and protozoa as well as other contaminants larger than .20 microns (see our particle size chart here). It will “NOT” remove viruses and other micro-organisms smaller than .20 microns. This does not bother me, I use the Katadyn to clean the water and then always use my SteriPEN Defender to sterilize it afterwards (a great combination and one I trust 100%). It will produce 1 liter of water per minute provided the water is not to murky. The dirtier the water, the lower the flow rate. TIP: Using an elastic or rope, wrap the pre-filter (black tip that sinks in water source) with a fine mesh cheese cloth. This will reduce the amount of silt and other particles from clogging up the pre-filter, an secondly, the internal ceramic filter as quickly – this will help reduce the pressure required to pump water and less frequent cleaning of the pre-filter. IMPORTANT: Like most portable filters, you cannot use the Katadyn Pocket filter in freezing temperatures – if the there is water left in the ceramic filter, it will likely crack if it freezes. #1 is quality! 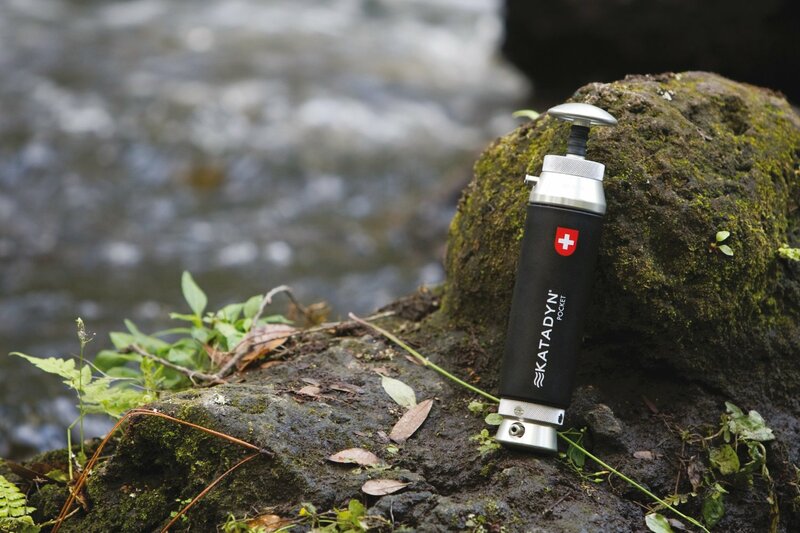 The Katadyn Pocket Water Filter is made in Switzerland and their attention to detail and materials is evident in this filter. Like Swiss army knives, Katadyn products are made to exacting standards. The Katadyn Pocket Water Filter is part of Katadyn’s Endurance series of products. 13,000 gallon capacity per filter – unit itself will last much longer. Warranty! The best in the business and then some – 20 Years! 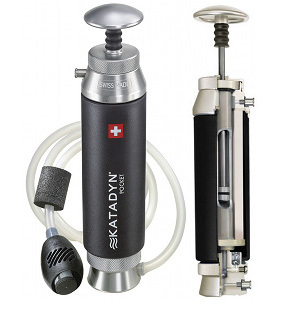 The Katadyn Pocket Water Filter will work in any type of water, however the dirtier it is, the harder it is to pump. Ideally, find the cleanest area of the water source you have. If it gets to hard to pump, you will have to clean the filter (see video above). 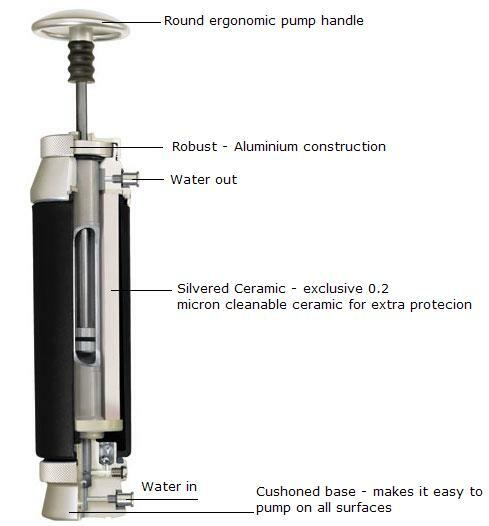 Compared to other portable water filters that use a pump system, Katadyn is one of the harder to pump, this may seem like a bad thing, but it is not, the use of their silver impregnated ceramic filter is rock solid and it takes a good amount of pressure to force water through it – this aspect of the Katadyn filter is why it last so long and back by such a strong warranty. 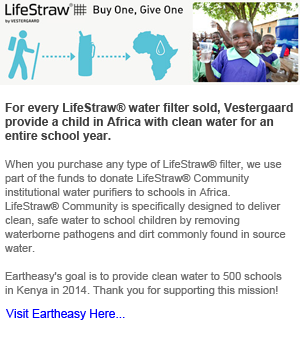 It is a little heavier than similar water filters, but much more compact. It will easily fit into any back pack, suit case or even the glove box in a car. It is so durable that Katadyn backs it with a 20 year warranty! Like any purchase of a quality product – customer satisfaction, it is so nice to own something you can trust 100%. Katadyn has long been a supplier to the U.S. Armed Forces, Navy SEALS, Army Operations’ Force, Marine Corps, the U.S. National Parks, Forest Service, International Red Cross, and many other relief and government organizations around the world. The following information provide the basic specs for the Katadyn Pocket Filter and internal diagram. Please Note: The filter is silver impregnated ceramic – silver’s antimicrobial properties are known to kill many microbial organisms. Not that I would rely on this feature for producing safe drinking water, but it shows just how much consideration has gone into the design of the Katadyn Pocket Water Filter. The Katadyn Pocket Water Filter is my favorite of all the portable water filters that I own. Other than the amount of pumping required to produce water, I have nothing bad to report on the Katadyn. It is an exceptionally well made water filter and you “WILL NOT” be disappointed with it…provided your expectations are realistic. It is important to remember that the Katadyn Pocket Water Filter is best suited to light weight travel where space is at a premium. If your plans include a base camp of sorts and the use of a vehicle, you may be better off to look at the Lifesaver Jerrycan which is design for larger volumes of water and a capacity of 5 gallons (so adequate space is necessary) – it will also remove all bacteria, viruses, cysts, parasites, fungi and all other microbiological waterborne pathogens. If your trip involves travel on foot and a base camp, you may want to consider buying all 3 items. In my opinion, regardless of your setup, the Katadyn Pocket Water Filter is a must have product. When other products fail, you can always rely on a Katadyn Endurance product like this Micro Filter.